Distinctive Element: In our years of experience in youth ministry, we have noticed a tendency for the church to overlook the area of natural ability. However, we know that Christians who truly believe God created them for a special purpose live differently. This assessment goes far beyond a mental understanding that students are special and unique. Rather, it shows students how to harness their unique skills so that it impacts the way they live from day to day. Why a unique abilities assessment? 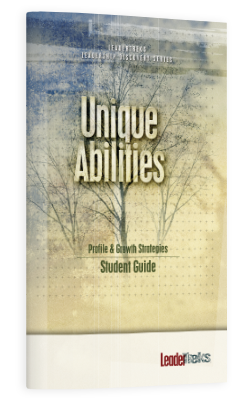 We created the Unique Abilities assessment because every student in every youth ministry needs to understand that he or she adds value to the Body of Christ. By going through this assessment, your students will be able to identify their natural talents and then be able to utilize those talents to supercharge their impact on the world and further God’s Kingdom. Students go through a four-step process to discover their unique abilities, see the value of their unique abilities, see the value of other’s unique abilities, and learn how to use their unique abilities to further God’s Kingdom. Biblical Background: God made each of us unique (Psalm 139). We are His special creations, and He has a plan for each of our lives (Jeremiah 29:11). God wants all of His children to understand how they have been made, including discovering their unique natural abilities. When students understand how they are wired, they can find their place in life.